August 28, 2014  College football's top division has a new playoff system this season. We'll talk about how it works, and how the field of potential contenders looks. August 21, 2014  Mo'ne Davis has dazzled at this year's World Series. The 13-year-old pitching sensation is already throwing in the 70s, as in miles per hour. Some believe she could be an elite pitcher. August 14, 2014  A U.S. district court judge ruled that the NCAA was violating federal anti-trust law by prohibiting payments to athletes whose names, images and likenesses are used in video games and TV broadcasts. The NCAA has appealed. So, what now? August 8, 2014  In the dog days of summer, Major League Baseball's regular season has nearly 50 games left. Fans have their eyes on postseason play, and every division has tight races. August 7, 2014  Major college sports programs could take a significant step toward sharing their wealth. 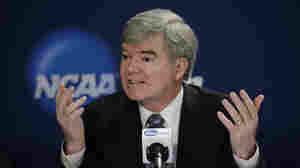 The NCAA Board of Directors is to vote on a plan to restructure Division I athletics. August 5, 2014  Federal prosecutors have formally charged the owner of an anti-aging clinic with distributing illegal steroids. Anthony Bosch surrendered to federal agents, and he has been cooperating with investigations. Last year, Major League Baseball suspended a dozen players, including Alex Rodriguez, with ties to Bosch and his clinic. July 14, 2014  Germany takes home the 2014 World Cup title after a 1-0 win over Argentina on Sunday. It was a tense match that saw a lot of action but no score for more than 90 minutes of play. July 11, 2014  Melissa Block talks to NPR's Tom Goldman about the final two matches in the World Cup: Brazil against the Netherlands in a fight for third place, and Argentina against Germany in the final. July 9, 2014  Argentina beat out the Netherlands for a trip to the World Cup final, winning the game in penalty kicks. In the final, Argentina will face Germany, which dismantled Brazil in stunning fashion. July 9, 2014  Host country Brazil was eliminated from the World Cup in epic fashion: Germany defeated Brazil 7-1 during the semifinal match. 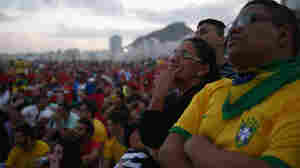 Brazilians are wondering how their beloved team could be so pulverized. July 8, 2014  Germany poured seven goals on Brazil in the World Cup semifinal. The home team had faced a steep challenge, playing without two key players, one injured and one suspended. July 8, 2014  Star player Neymar is out with a back injury. The team will also be without star defender Thiago Silva, who was penalized earlier in the tournament. So how does the host team go on against Germany? July 5, 2014  Despite Brazil's win against Colombia in the quarterfinals, fans aren't entirely sure they can win the tournament. One key player is out for an injury; another for racking up too many penalties.